SpaceX successfully launched its third re-flown Falcon 9 rocket Wednesday, lifting off from Florida’s Cape Canaveral at sunset with the SES 11 broadcasting satellite. 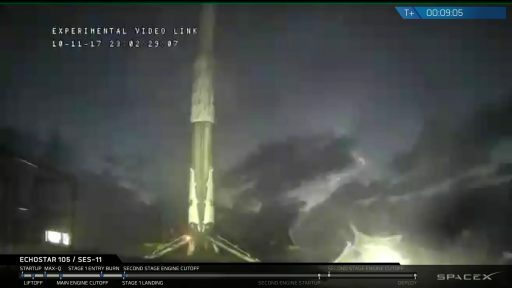 Checking off the company’s second orbital delivery in just 60 hours, Falcon 9 successfully sent the 5,200-Kilogram satellite into a Geostationary Transfer Orbit and managed a challenging first stage landing on SpaceX’s East Coast Drone Ship that battled choppy sea conditions in the landing zone. 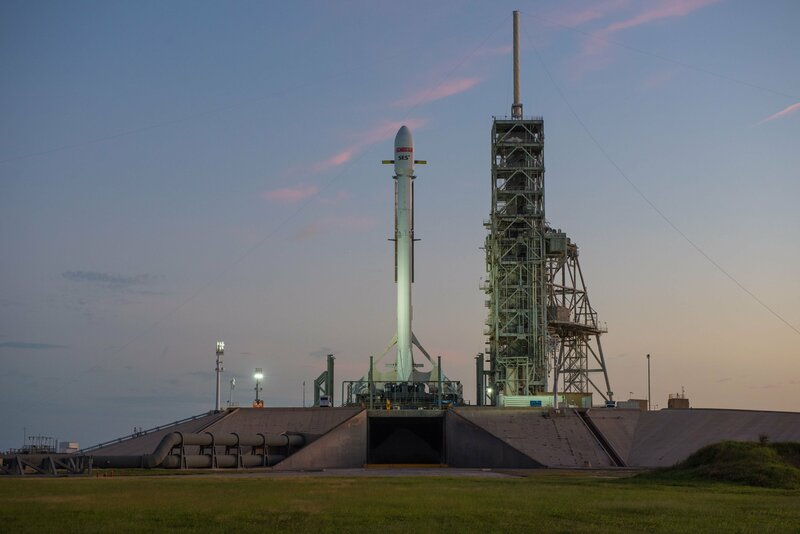 The 70-meter tall Falcon 9 thundered off from Launch Complex 39A at the Kennedy Space Center at 22:53 UTC, 6:53 p.m. local time – just three minutes before sunset. Departing the Florida Space Coast, Falcon 9 turned eastward, flying toward the dark of night for its sixth Geotransfer mission of the year. The first stage dropped away after firing for 155 seconds and the MVac-powered second stage first injected the vehicle into a Parking Orbit before igniting again to lift the high point of the orbit and send SES 11 on its way 36 minutes after liftoff. 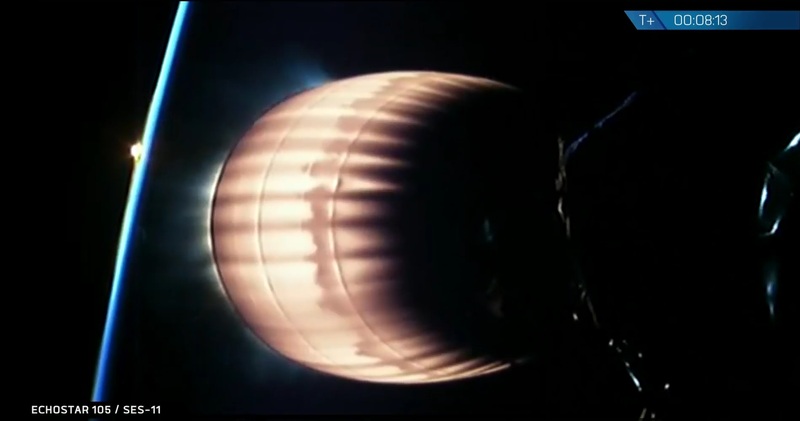 For the first stage, separation marked the beginning of a high-speed return to Earth as the mission did not allow the booster to slow down much before hitting the atmosphere. A brief three-engine entry burn hit the brakes at the last moment before experiencing the intense heat and deceleration of re-entry. Descending toward the ‘Of Course I Still Love You’ Drone Ship, Booster #1031 lit up its center engine and managed a challenging landing, coming to rest at twilight to keep SpaceX’s streak of landing successes unbroken, now up to fourteen. Wednesday night’s flight came right on the heels of the successful West Coast mission of Falcon 9, deploying the third group of Iridium-NEXT satellites on Monday after lifting off from California’s Vandenberg Air Force Base. 2017 has been SpaceX’s most productive year yet; the California-based launch provider is now up to 15 performed missions this year and on course to hit its target of 20 flights that will put the company above any commercial contender and competes favorably with the number of launches performed by Russia and China. Wednesday’s Falcon 9 mission was the 43rd launch of the SpaceX workhorse, the 23rd of the Full Thrust version and the third of a ‘flight-proven’ first stage, that is one that has at least one prior operational flight under its belt. 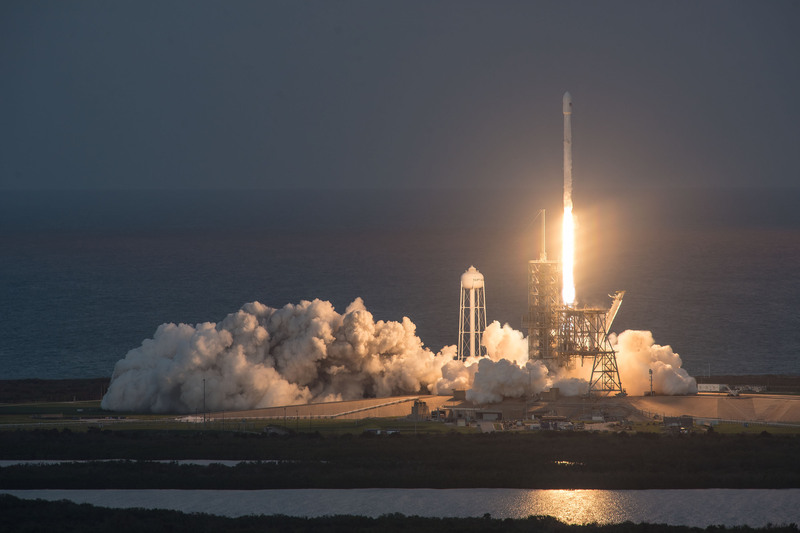 The mission was the first Geotransfer mission for the Falcon 9 after a string of four Low Earth Orbit deliveries and marked Falcon 9’s six high-energy deployment of the year. SES and SpaceX finalized plans in August to fly the SES 11 mission with a previously used first stage in continuing efforts to bring re-flight missions closer to routine, a step SpaceX hopes to complete when inaugurating the Falcon 9 Block 5 version that will allow for rapid and cost-effective re-use. The first stage flying on Wednesday made its first trip into space back in February when lifting the Dragon SpX-10 cargo spacecraft into orbit for an ISS resupply mission under SpaceX’s contract with NASA. 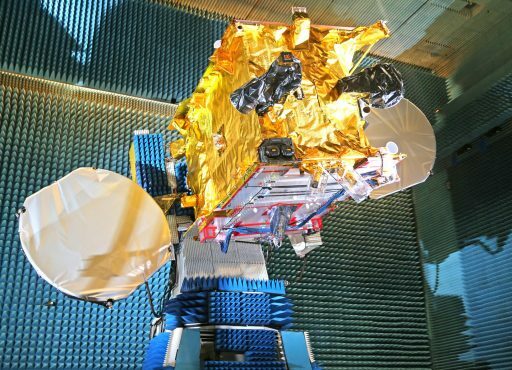 SES, headquartered in Luxembourg and one of the world’s largest satellite communications providers, has been a faithful customer to SpaceX for several years. 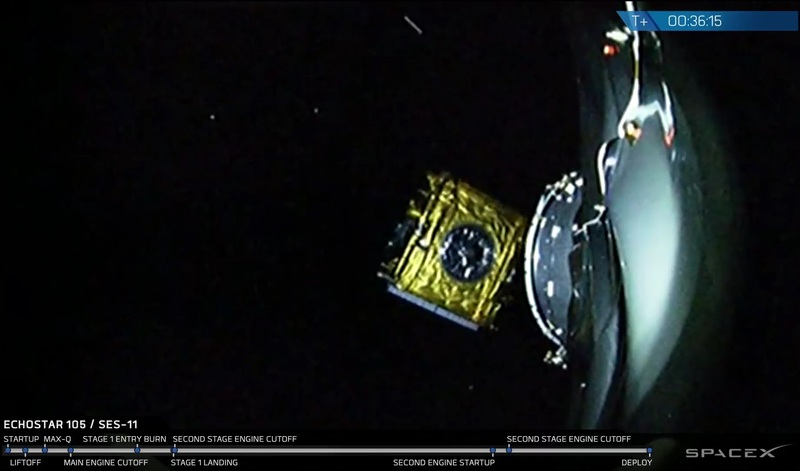 It was the SES 8 satellite that became Falcon 9’s first-ever payload carried into Geostationary Transfer Orbit in December 2013 and the SES 9 satellite, heading uphill in March 2016, was the first GTO mission for the enhanced Falcon 9 FT vehicle. Earlier in 2017, SES and SpaceX made history with the first Falcon 9 re-flight mission that successfully lifted the SES 10 satellite and brought SpaceX’s re-use concepts a big step closer to reality. The second re-use mission came in June with the BulgariaSat-1 satellite. SES 11, also known as EchoStar 105, was built by Airbus Defence and Space based on the flight-proven Eurostar E3000 satellite platform, hosting a hybrid communications payload comprising 24 Ku-Band and 24 C-Band transponders. The satellite’s entire Ku-Band capacity has been leased to EchoStar for media distribution and digital networking services in the U.S., Canada, Mexico and the Caribbean while the C-Band payload will be operated by SES for video and data services. Destined for a position at 105° West in Geostationary Orbit, SES 11 will replace a pair of satellites: the 13-year old AMC-15 Ku/Ka-Band satellite and the all-C-Band AMC-18 that has been in operation since launching in 2006, though recently suffered an anomaly. Built for a 15-year service life, SES 11 is joining the SES 1 and SES 3 satellites at the center of SES’s North American neighborhood from where the company reaches more than 100 million TV homes. SES 11 was initially planned for liftoff on Saturday, but SpaceX had to reverse the order of their Falcon 9 double-header when an engine-related issue cropped up on the 1031 booster. The vehicle was wheeled from its pad-side hangar up to Launch Complex 39A Tuesday afternoon and took its vertical launch position before sunset to spend 24 hours overlooking the ocean while engineers put the finishing touches on the rocket and launch complex. After power-up on Wednesday, Falcon 9 went through a myriad of checkouts to clear the way for the fast-paced automated countdown sequence, picking up at the T-70-minute mark after all launch controllers at the Cape and engineering support in California gave a unanimous GO, looking at a clean vehicle and very favorable weather conditions. The complex tanking sequence kicked off with loading some 155 metric tons of Rocket Propellant 1, chilled to -7°C, into the two-stage rocket. Liquid Oxygen loading picked up on the first stage at T-35 minutes and 15 minutes later on the second stage in a carefully throttled sequence to ensure Falcon 9 reached its flight mass of around 360 metric tons of -207°C LOX just in time for liftoff, preventing the sub-cooled oxidizer from warming excessively. The vehicle also received Helium pressurant gas to keep the tanks pressurized during flight and Nitrogen attitude control system propellant to keep both stages of the rocket flying true and level throughout the mission. While propellants were loading into the Falcon 9, SES 11 made its transfer to internal power and the Eastern Range declared clearance for launch. Dozens of computer-controlled events were checked off in the last seven countdown minutes, starting with the chilldown of the nine Merlin 1D engines on the business end of the vehicle. 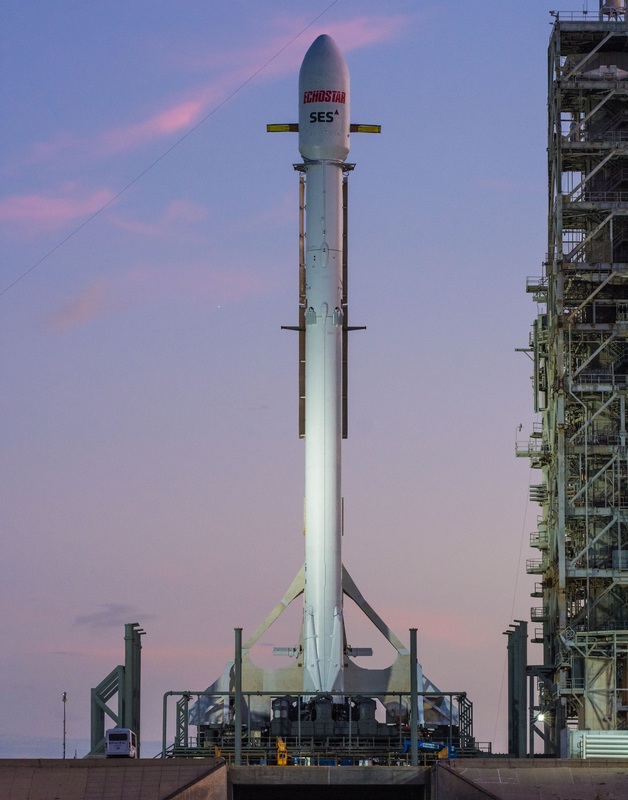 Final hydraulic checks were passed without issue and Falcon 9 began standing on its own as the Strongback structure retracted by 1.5 degrees and prepared for a rapid kickback at liftoff. 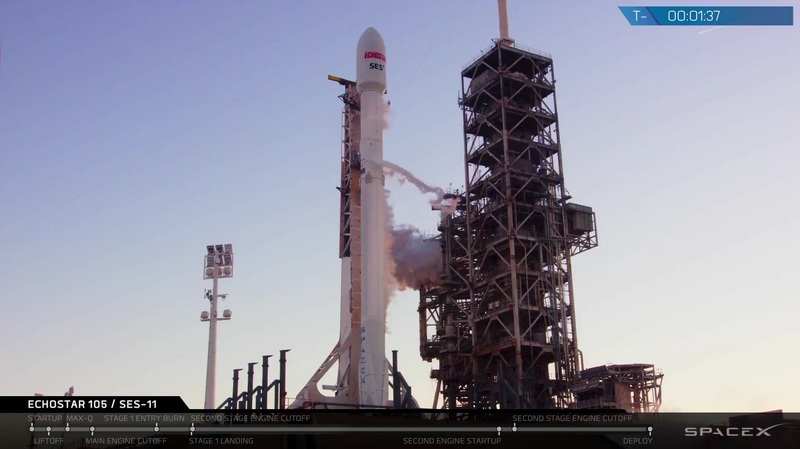 Flight levels on all tanks were called out by T-2 minutes and Falcon 9 was handed control of the countdown at T-1 minute, coinciding with the final call that the vehicle’s Autonomous Flight Termination System was ready. With the final GO given by the Launch Director with half a minute on the clock, Falcon 9 reached flight pressures and started breathing fire at T-3 seconds, lighting up its nine Merlin 1D engines to reach a collective launch thrust of nearly 700 metric tons. Falcon 9 made its 11th blastoff from historic Pad 39 right at the opening of the launch window at 22:53:00 UTC, rising vertically as the nine engines gimbaled to keep the 550-metric-ton rocket in an upright posture. 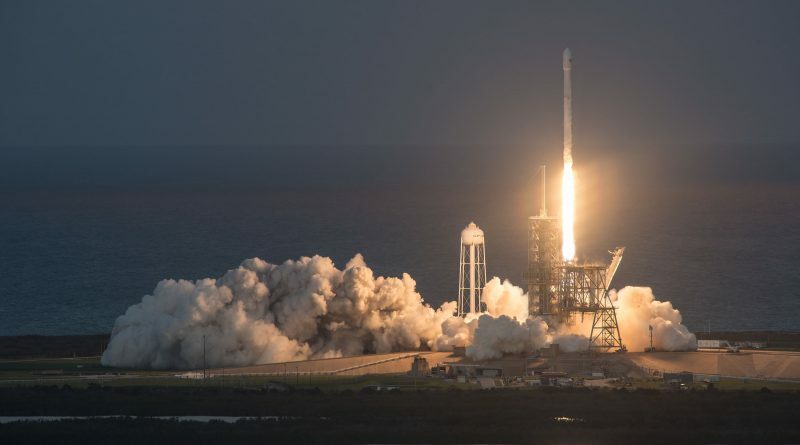 With colorful skies as a backdrop, Falcon 9 began its pitch maneuver to attain a south-easterly ascent trajectory on the standard route to Geostationary Transfer Orbit, aiming for a quick overflight of the Atlantic Ocean. Burning 2,450 Kilograms of chilled propellants per second, Falcon 9 reached the speed of sound under 70 seconds after launch and encountered Maximum Aerodynamic Pressure at T+78 seconds, throttling back on its engines for a brief period to reduce stress on the used airframe of the rocket. MaxQ has been a point watched very closely in SpaceX’s re-use missions to date as it puts the once-flown airframe through peak stresses for the second time. 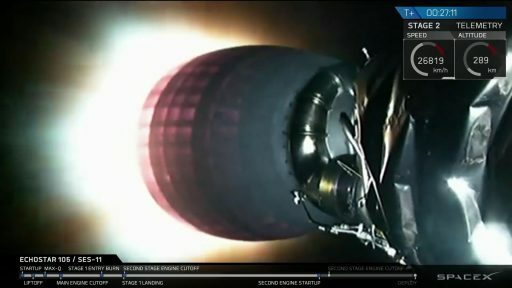 While the first stage was still firing on all cylinders, the MVac engine on the second stage began chilling down its turbomachinery to be ready for stage separation. MECO – Main Engine Cutoff on the first stage was confirmed two minutes and 35 seconds into the flight after the Booster #1031 accelerated the stack to a speed of 2.29 Kilometers per second. Stage separation, accomplished via four pneumatic pushers, occurred three seconds later at an altitude of 68 Kilometers with the second stage immediately switching to start-up and the first stage holding its orientation to avoid being blasted side-on as the second stage fired up. The 95,000-Kilogram MVac engine ignited just two seconds after staging on a planned burn of five minutes and 58 seconds to push the vehicle into a Low Earth Parking Orbit. Due to the energy requirements for a GTO mission, the first stage was only able to save a minimum of propellants for its trip back to Earth. Therefore, it remained on a ballistic arc after stage separation, not performing a boost back maneuver which required the OCISLY Drone Ship to be moved quite a bit off shore, holding position 636 Kilometers from the Cape Canaveral launch pad. 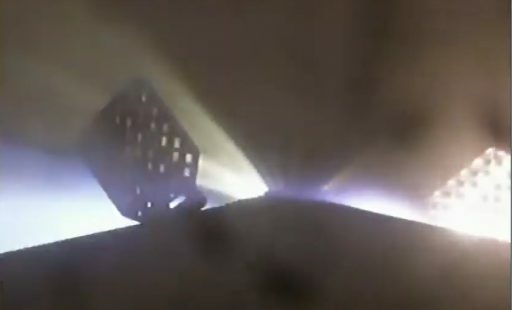 While flying outside the atmosphere, the first stage reached a peak altitude of 119 Kilometers used its nitrogen thrusters to orient itself for re-entry. Dipping into the dense atmosphere, the booster fired up three of its engines at T+6 minutes and 28 seconds when passing 58 Kilometers in altitude. The brief 20-second Entry Burn slowed the booster by 651 meters per second to 1.64 km/s in order to create a manageable re-entry, but with much higher heat load than a Low Earth Orbit mission (for reference, Monday’s Iridium-3 mission, as a typical LEO delivery, had an entry speed of only 870m/s). The rigors of re-entry became evident through onboard camera views from the booster that showed plasma around the booster and the grid fins briefly catching on fire, a sight that will only be around for so long as the Block 5 vehicle will use titanium grid fins that can weather the entry environment without issue. Descending through the atmosphere, the booster relied on its grid fins – or what was left of them – to maneuver toward the Drone Ship, holding a programmed position using its azimuth thrusters. 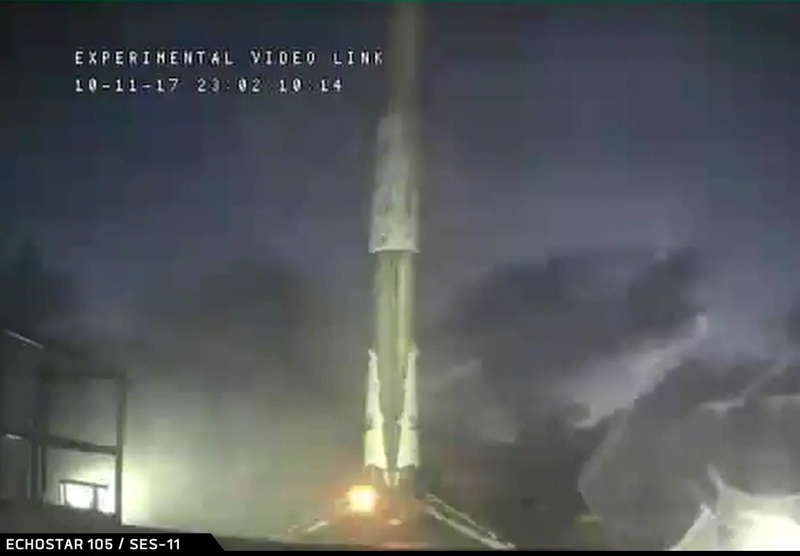 The booster fired up on the critical landing burn right at the T+8-minute mark, having passed through the sound barrier for the second time on Wednesday and the fourth time in its career. The engine and grid fins worked in unison to bring the booster to a vertical descent toward the Drone Ship’s deck and the four landing legs deployed just before touchdown. Despite rough seas and windy conditions, Booster #1031 managed an on-target touchdown on ‘Of Course I Still Love You,’ bringing SpaceX’s record to 18/23 for overall landing success, 11/16 at sea, and improving the company’s streak to 14 successful recoveries in a row. As the Block 3 booster, the 1031 vehicle is unlikely to see space again, though its recovery represents important data for SpaceX on the condition of the various components on the vehicle after going through the flight environment twice. While the first stage navigated through gusty winds, Stage 2 was much higher up where aerodynamics were no longer a concern. 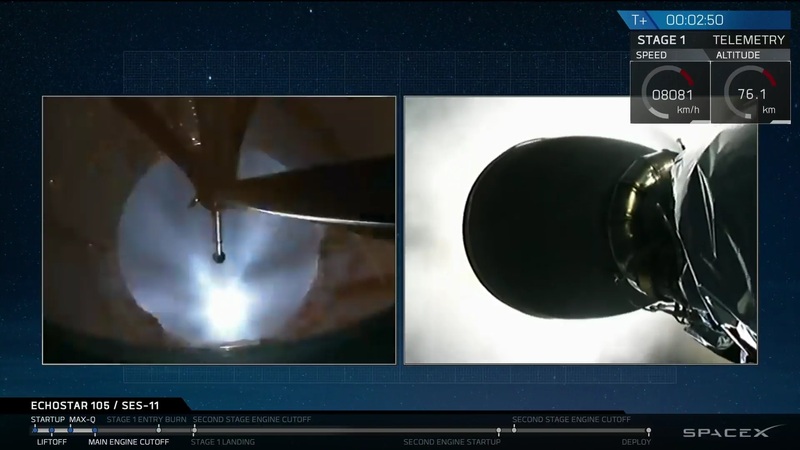 Falcon 9 separated its fairing three minutes and 40 seconds into the flight and the second stage delivered excellent performance, shutting down eight minutes and 38 seconds into the flight when sensing it had arrived in orbit. Next for the second stage was a coast phase of a little over 18 minutes to continue heading south east and perform the second burn around the equator in order to position the high point of the resulting orbit above the equator on the opposite side of the planet – easing the process of transferring the satellite into its operational Geostationary Orbit. MVac re-started at around T+27 minutes, 5 seconds and burned for ~56 seconds, spending the last part of the burn in a gradual throttle-down to limit acceleration on the second stage and satellite to 5Gs. 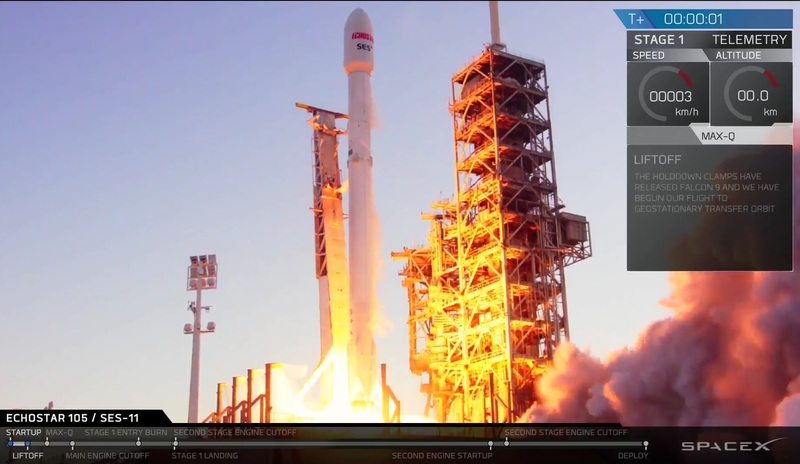 The second burn raised the vehicle’s velocity by 2.45 Kilometers per second and Launch Controllers called out a good orbital insertion, confirming Falcon 9 had reached the intended elliptical orbit. SES 11 departed the second stage 36 minutes after launch and was expected to check in with ground stations a short time later to begin a checkout process before several days of orbit-raising operations to maneuver into Geostationary Orbit where the satellite can remain locked over the same location on Earth. Checking off a pair of missions this week, SpaceX will now shift focus on its next flight, aiming for an October 30 liftoff with the KoreaSat-5A communications satellite, also targeting Geostationary Transfer Orbit. SpaceX missions from Florida are expected to shift back to Space Launch Complex 40 in November, allowing LC-39A to enter a downtime while undergoing outfitting work for the inaugural Falcon Heavy mission that is still on the manifest for late 2017, though likely to slip into next year.